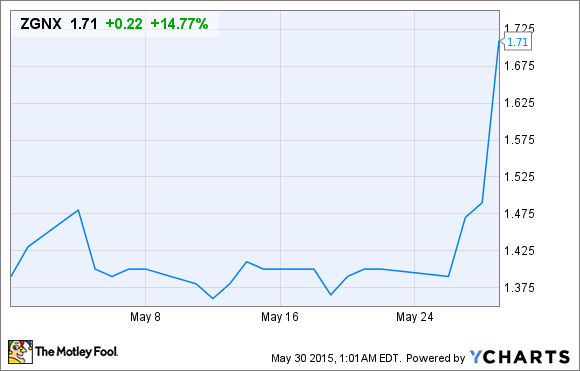 Zogenix shareholders were surprised with a substantial gain in May. Find out what data Zogenix released that has investors and Wall Street abuzz and whether or not this latest rally can continue. What: Shares of Zogenix (NASDAQ:ZGNX), a biopharmaceutical company focused on developing therapies to treat central nervous system disorders, rocketed higher by 22% in May, based on data from S&P Capital IQ, after announcing surprising data on fenfluramine. So what: According to a press release issued by Zogenix on May 27, a low-dose of fenfluramine, a drug previously used as an anti-obesity drug, demonstrated impressive efficacy in a five-year, 12-patient study that focused on treating a rare form of childhood-onset epilepsy known as Dravet syndrome. The study, which was presented at the European Pediatric Neurology Society Congress, showed that 80% of patients between 2010 and 2014 experienced a reduction in seizure frequency equal to or greater than 75% every year. Additionally, three patients were seizure-free during the entire five-year period, while five patients were seizure-free for periods of two-to-four years. Given this surprising find, Zogenix plans to initiate clinical studies of low-dose fenfluramine later this year, with the possibility of filing for a new drug application in both the U.S. and EU in 2016. Now what: This news was just what the doctor ordered (pardon the pun) for Zogenix shareholders after the company sold pain med Zohydro ER for what felt like pennies on the dollar earlier this year, considering all of the research and expensing that went into its development. Taking into account Zogenix's new-found focus on Relday and fenfluramine (also known as ZX008), this is a great start down its new path. However, I can't help but remain a little skeptical considering fenfluramine's shaky past (it was pulled from the market as the "fen" in the fen-phen combo anti-obesity drug), and the growing competition in the Dravet syndrome space. Let's not forget that GW Pharmaceuticals (NASDAQ:GWPH) is advancing Epidiolex as well, and it, too, has shown solid promise. Dravet syndrome isn't a large indication, so unless Zogenix's fenfluramine data truly hits the mark in its phase 3 studies, Zogenix's valuation could take a hit. My suggestion continues to be to remain on the sidelines until we have definitive late-stage data that can help us make a decision. With only a small, long-term study under its belt, there are still far more questions than answers.